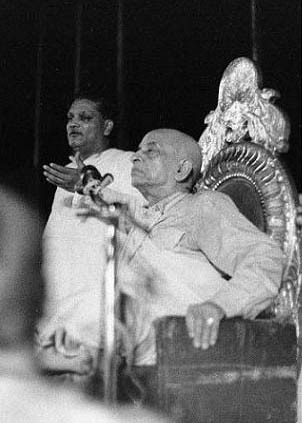 It is of no small significance that Srila Prabhupada was given the birth name Abhay Charan "fearless at the Lord's feet", which was further confirmed by his own guru's conferring upon him the same name at his Harinam initiation in 1933, Abhay Charanaravinda Das. And Srila Prabhupada's whole life was to pointedly exemplify this glorious truth: that Lord Krishna's devotees are personally protected by the Lord at all times. During the course of his amazing life, many specific incidences dramatically demonstrated the Lord's saving Abhay while he was in the midst of eminent dangers. Srila Prabhupada was thus fully aware of Lord Krishna's complete protection, specially when he fearlessly embarked on his trip to America to fulfill his great teacher's sacred order. And he was able to also inject his many sincere followers with the same conviction of divine protection in their own epic efforts to spread the Sankirtan Movement all over the world. This is no small feat, as religious historians have duly noted. There is a very inspiring statement by Srila Prabhupada that allows us a very revealing glimpse into the heart and mind of such a pure lover of God. Upon arriving in Dallas in 1974, Srila Prabhupada was duly greeted and honored by dozens of his loving disciples. One reporter observing this unique loving exchange candidly asked him what made him so endearing to his followers and what it really meant to be self-realized. Srila Prabhupada answered in his own unique way with this simple yet profound statement: "I AM NEVER AFRAID." Upon hearing these words, I started reflecting on how much meaning they revealed. I thought how this is essentially the whole difference between material life and the state of spiritual perfection. No one in this world is capable of honestly saying that they are never afraid. In this world of unavoidable danger, we can never be guaranteed of safety nor assured of longevity. We have next to no control over these realities. So fear stalks us all, whether we acknowledge this or not. And death stares us all in the face, whether we want to look or not. So is there any escape from our human condition's fragile finality? Only those righteous souls who have put their full trust in God only are capable of achieving any real serenity and peace. The beginning of wisdom is to understand our utterly dependent condition towards our Master and to gratefully seek obedience to His benevolent will. God's pure servants have revealed the real cause of all our fears and anxieties: our ungrateful envy of God and aversion to His sheltering service. These great souls offer us the only remedy to extract this poison of envy from our weakened hearts: the submissive attitude to serve His perfect will by opening our hearts to glorify Him. They give us the living example of their fearless lives totally absorbed in the constant glorification of the Lord. As our well-wishers they entreat us to at last leave all our troubles behind by fully acknowledging how great God is and how small we really are. As much as we choose to give up our envious pretenses, the more that innate flow of attraction to glorifying our Lord will gradually manifest in all our words and deeds. As we become thus surrendered to serving our dear most Friend, then His sweet love will rise again to remove all fear from our liberated hearts. Srila Prabhupada also wisely stated that "kirtan is the safest place in the universe”. The great purifier of the whole world, Krishna-kirtan alone can eventually bring us to the fullest state of grace, forever free of all fear, the reward of the fully faithful souls. And we have Srila Prabhupada’s glorious life as the most powerful and enduring demonstration of such perfection. As always, his shining example remains the most inspiring impetus to also seek such a state of blissful surrender, fearlessly fixed in the Lord’s eternal service.